On our final full day in Montreal, we make a pilgrimage to the oldest cheesemonger in Quebec. As true pilgrims, we trudge on foot, some two hours, between Marché Jean-Talon and our downtown hotel on Boulevard René Lévesque. Marché Jean-Talon, the largest year-round farmer’s market in Montreal, is where one finds the head office and main retail store of La fromagerie Hamel—in the cheese business since 1961. 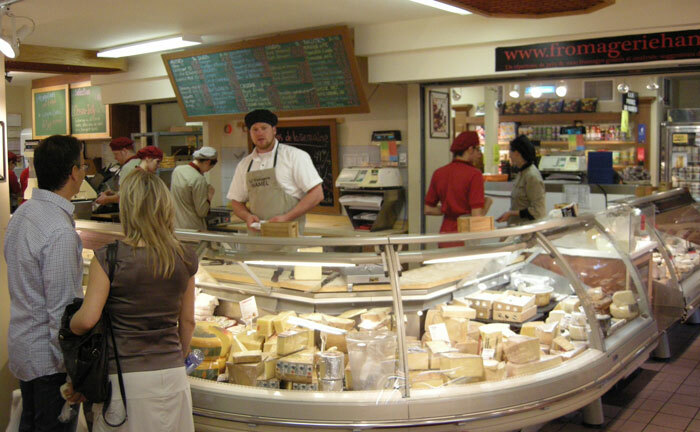 There are some 700 varieties of cheese on display at La fromagerie Hamel in Marché Jean-Talon in Montreal. La fromagerie Hamel now has five locations in Montreal including the flagship store at Jean-Talon. The name comes from its founder, Fernand Hamel, who owned the business until 1988 when it was purchased by Marc Picard who runs the business today with his wife, Murielle Chaput, and his son, Ian Picard, who has been the master fromager affineur for the past decade. Mamirolle, a pasteurized cow’s milk cheese from Central Quebec aged in the cave at La fromagerie Hamel. La fromagerie Hamel is the oldest cheese retailer in Quebec and, as far as we can make out, the second oldest in Canada. Olympic Cheese Mart at St. Lawrence Market in Toronto started cheesemongering in 1958. 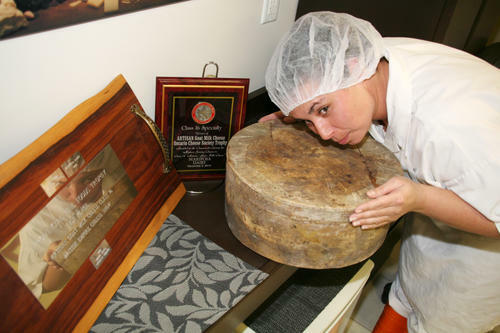 The high-profile Cheese Boutique in Toronto opened its doors in 1977. In the battle of bagels, we declare a draw between St-Viateur Bagel and the relative newcomer, Fairmount Bagel. There is no question: The best smoked meat sandwich is served at Schwartz’s Hebrew Delicatessen, a Montreal tradition since 1928. Georgs Kolesnikovs, Cheese-Head-in-Chief at CheeseLover.ca, departs Montreal tomorrow with his Significant Other for Le Festival des Fromages de Warwick.